The new method to activate MTN 100% double data bonus in 2018 is to send PROMO to 131 in a text message. After that, you will receive some messages welcoming you to the promo. After that, SMS 2 to 131. Another method that is working flawlessly right now is to buy a new MTN SIM, register it and you are good to go. This means you don't need to tweak any imei or send any sms or code. The double data is automatically activated for new subscribers and it valid for 3 months. This page was updated to accommodate this recent changes. Hello guys, remember the MTN double Data Bonus that we have being enjoying for a long time now via IMEI tweak? Now here is a new method to get MTN 100% Double Data data bonus without tweaking IMEI. Am sure it will be a good news for those using phones that are very stubborn to be tweaked and those that are afraid of changing their phone's original imei. It will also be a good news for iPhone users as they can now enjoy a tweak without tweaking IMEI. MTN double data offer has been around for over a year now but they recently reduced the bonus from 100% to just 20% in some phones and also stopped it on other devices. But this new method will restore the 100% data bonus on MTN DealZone in your phone so that you can enjoy more web browsing, downloading and streaming. So this tutorial won't require having an MTK device, rooted device neither downloads MTK engineering tools for you to acquire the double data offer. What you need is just sending SMS with a particular Code. Follow below procedures on how to get MTN Double Data Bonus Without changing IMEI. ✔️ First message: "Your request has been received"
✔ Second message: "You have sent an invalid command"
✔ Third message: "Dear Customer, enjoy Data offers on MTN Deal Zone, Dial *131*1#"
After receiving the third message, you can now purchase your data plan by dialling *131*1# and enjoy your double bonus. NOTE: The third message is what determines if your SIM is eligible or not. Once you receive the third message, you can start with small data plans such as the 50mb for N100 and check the balance, if the bonus is there, you can proceed to other bigger plans. If it wasn't given, don't spend more money. Thanks for coming up with this awesome trick. Those who have been browsing with MTN data should avail themselves of this golden opportunity. Pls Catherine don't make our dear brother blush this early morning, or I he has blushed ������finish self. Thanks for the feedback. Let's drop more positive feedbacks so that others could be attracted to it. Thanks for coming back to give ur feedback. I saw your recent post which is all about MTN DOUBLE DATA. I follow the procedure and I got a message from MTN as it was written in your post. But my doubt is that, have use that sim for double data before for 6months. My question now is:- IF I SUBSCRIBE ON THAT SAME SIM, WILL I GET ANOTHER 3GB? OR I SHOULD GET ANOTHER SIM WITHOUT CHANGING IMEI? @Hassan ve download it but find it difficult to register my mail. Use Quick Sign Up and note that your name will start with @eg @wizytechs. Yes bro, you can re echo that again and again. 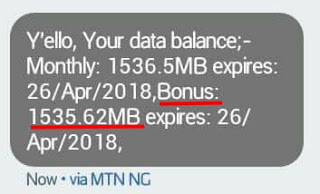 Y'ello, Your data balance;Daily: 50.0MB expires: 07/Aug/2017,Monthly: 1024.0MB expires: 05/Sep/2017,Bonus: 1574.39MB expires: 05/Sep/2017, wizy MTN supposed to give me 1.5gb but only saw 1gb 500mb as bonus sorry when them they start That? I jst did as u instructed nd I got all d reply as at above but I sub 4 5omb I was not given any bonus. Any help? Will it change my package from mtn pulse. Yes definitely because this offer is for mtn deal zone customers. Yes from the above information on how to do the double data bonus it is stated earlier that it is on mtn deal zone. Thanks love to hear positive reply/result towards a comment. If you have 10 naira on ur mtn sim open ur message box type GOODNESS and send to 55331 mtn will give you 10MB 50 Naira airtime, *559*4# to check ur MB. it work in all mtn sim/ all phones. It's working perfectly on my SIM that had already benefited from the previous 100% data bonus. I've just tested it with a day plan and I've received an equivalent data bonus. Thanks. To get airtel 6 for n1500, you need to change your imei with blackberry imei. See list of BB imei HERE . Thanks WizyTech s Blog am still enjoying your double bonus. I stated with 20mb for 50 Naira and i've 20mb double bonus 20mb all =40MB. Nice update Wizy. This is a very good news to MTN users Getting more value for ones money. This thing worked for me today. Thanks man. Oga wizy . I've enjoyed the double data for six months now and I subscribed last week and it didn't double.. I followed your instructions by sending promo to 131 and I got a message that says" Thank you for your request for device bundle at naira 1.00/day please reply"
When I bought my camon cx air I saw double data but on subscription I saw nothing like that I hope this works. Note that the duration for double data bonus is usually 6 months for each eligible sim. However, if yours exceeds 6 months, it means you are lucky. Just like my airtel SIM, I have been enjoying the bonus for over a year now. Thanks weezy it work on my sim.